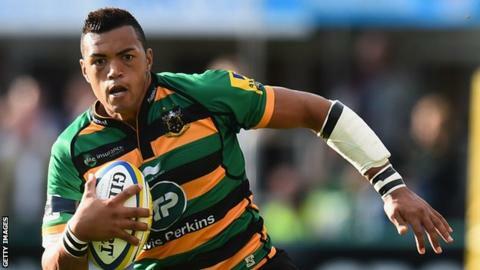 Northampton Saints centre Luther Burrell has said he feared for his place in the England squad. The 26-year-old is one of five centres selected by Stuart Lancaster for the upcoming autumn internationals. "In the build-up to it I've been quite worried, because there have been a lot of midfielders in form," he told BBC Radio Northampton. "For me it was trying to be the player I was at the back end of last season. Thankfully it's paid off." Burrell only made his England debut eight months ago, but has already made seven Test appearances and formed a regular partnership with Gloucester's Billy Twelvetrees. Bath pair Kyle Eastmond and Jonathan Joseph are among Lancaster's options, while Saracens' Brad Barritt will also be challenging for his first international start since last year when England face New Zealand on 8 November. Leicester centre Manu Tuilagi may be added to the squad should he overcome a groin injury. "It's a huge honour to be selected and I'm really chuffed," said Burrell, whose Saints side face Ospreys on Saturday in a European Rugby Champions Cup pool match. "It's still a huge rollercoaster and a huge learning curve. I still believe I've got a lot of learning to do. "But I'm hugely excited to get this huge game at the weekend out of the way and then get into camp and potentially have a great four weeks with the England side."